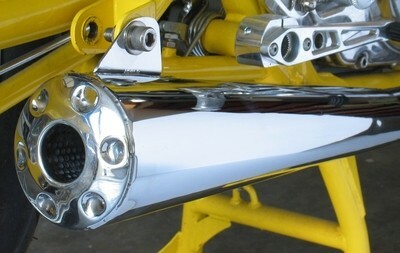 Polished stainless extra short megaphone silencer to fit the SR500 & SR400. 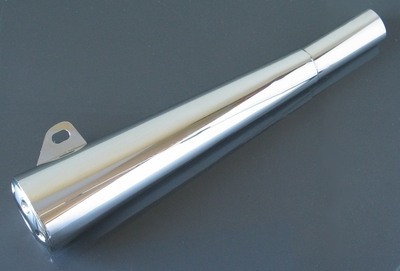 This is a high quality polished stainless steel extra short megaphone silencer. Featuring a free flowing straight through design with a fiber packed perforated core. The exhaust note is deep and pleasant. This is quieter than our reverse cone megaphone silencer. Weighing in at 1100 grams, the overall length is a short 48cm. The inlet diameter is 41mm. Outlet diameter is 35mm. 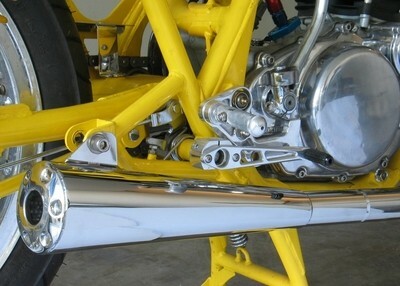 It mates up perfectly with our standard bend or swept back stainless header pipes. It may also be used with the original header pipe.